Get a handle on excess plastic grocery or shopping bags with an inexpensive bag holder. Available as cabinet mounted or freestanding units, these holders contain bags while making them easy to access. Place the plastic bag holder next to the garbage can for extra convenience. When the holder becomes full, recycle the whole bunch. Check home stores or SimpleHuman.com for these chaos taming holders. 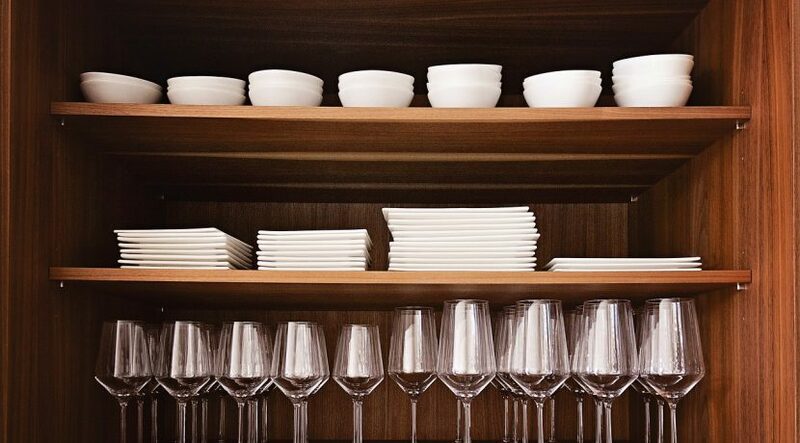 Get more mileage out of your kitchen cabinets with some creative dishware rearranging. For example, stemware glasses can be stored by placing every other glass upside down. To begin, pull all your dishes out of your cabinets to see what you have to work with. The most frequently used items should be on the bottom shelves of a cabinet that’s most convenient to you. 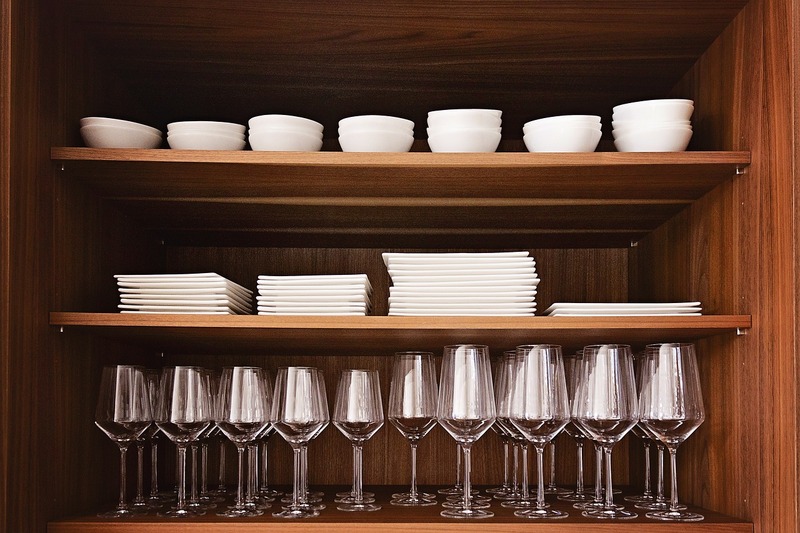 Consider rearranging the cabinet’s interior shelves to accommodate your different size dishes. If your shelves are stationary, nesting bowls and casserole dishes are a great space saver. Before ready-made plastic containers became popular, most of us recycled our grocer’s pasta salad container for leftover spaghetti. This led, and still leads, to cabinets and drawers full of mismatched containers and lids. Declare a moratorium on these tired reusables and invest in something like GladWare’s Containers with Interlocking Lids. Different size lids snap together, and each container nests inside another, giving you more cabinet space. This is one project you won’t want to put off. Discourage unappetizing fridge smells by tossing last week’s lasagna before it develops a moldy surprise. In fact, reassess the condition of all leftovers and check expiration dates on milk, juice and canned goods. Produce and lettuce often go bad quickly, so you may have to adjust the temperature on your refrigerator if you notice premature wilt. Give the fridge a thorough wipe down, then organize foods by type, with the most frequently used items in the front. If you haven’t already, acquaint your fridge with a box of baking soda. A baking zone in the kitchen is ideal for the cookie dough enthusiast and allows you to take quick inventory of your baking needs. Devote a counter and upper or bottom cabinet to the following: cookie sheets and loaf pans; a kitchen mitt or hot pads; and flour, sugar and other baking necessities in plastic containers (and placed away from the oven). If your mixer is stylish, leave it out on the counter; otherwise stash it with the mixing bowls. Consider other organizing zones for: beverages, cleaning supplies, mail and recycling and trash. Take 30 minutes to reassess your food storage, whether it’s a pantry, your kitchen cabinets or a freestanding cupboard. Start with the obvious: purge all expired foods. Next, sweep through your canned goods for extras you can donate to a local food pantry or a neighbor. Depending on the space, you may want to use a lazy Susan for spices and sauces or an over the door shelf to increase storage. Load up your pantry by grouping food by category or by time of day (breakfast, lunch, dinner and snacks) if you prefer. Recipes have a tendency to overrun a kitchen, especially if there’s a foodie in the house. Tackle your recipes by tossing any you haven’t used in ages (or that recipe for flan that turned to mush). The size of your recipe cards can determine which system you should use. Index cards work well in a labeled recipe box or a small photo album. Full sheet recipes do well in a three-ring binder. If you prefer room to grow, choose the binder and simply tape your index cards to larger sheets of paper. Handy dividers make for easy organizing either by ingredient or dish type.